FCPO 3rd month July Futures contract close unchanged at RM2680 as compare to previous trading session with 12,422 lots traded in the market. CPO price was traded wild due to wild movement from soybean oil and crude oil electronic price trading. Technically, CPO price seems stopped around the resistance levels at RM2730 regions during the trading session. We expect CPO price would trade lower in the coming trading session provided resistance levels at RM2730 and RM2755 regions were not violated. Traders were advice to hold short position in the coming trading session while be extra alert around support levels at RM2650 and RM2600 regions. FKLI April futures contract surge 4 point higher to close at 1032 as compare to previous trading session with total 10,826 lots traded in the market. FKLI was traded sideways during trading session as market seems lack of incentive from foreign equity indices performance. 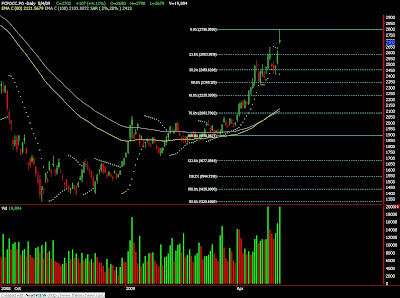 Technically, FKLI seems hit 78.6% and 278.6% Fibonacci projection levels at 1037 regions. We expect FKLI would starts to retrace in the coming trading session provided resistance levels at 1037 and 1060 were not violated during trading session. Traders were advice to take profit from the existing long position if support levels at 1024 and 1000 not able to uphold against the selling pressure. FCPO 3rd month July Futures contract rebound RM55 higher to close at RM2680 as compare to previous trading session with 17,413 lots traded in the market. CPO price was traded higher slowly due to strong soybean oil and crude oil electronic trading manages to uphold against the selling pressure. Technically, CPO price seem formed at rising diagonal in 5min price chart after bottomed around RM2603; 50% of Fibonacci projection levels. We expect CPO price still riding on the correction wave with critical resistance seen at RM2700 and RM2730 regions. 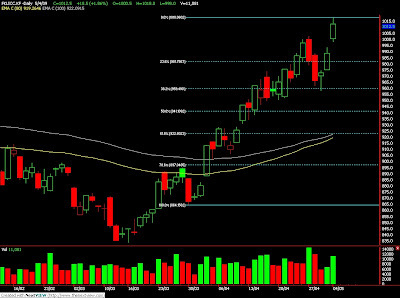 Traders were advice to hold short position in the coming trading session provided resistance levels were not violated. 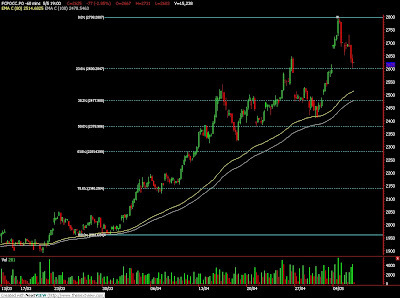 Support levels were seen at RM2675 and RM2657 regions. FKLI April futures contract surge 22.5 point higher to close at 1028.5 as compare to previous trading session with total 9,810 lots traded in the market. FKLI starts trading higher in the 2nd trading session as Singapore indices surge up more than 100 point due to positive report on the financial sector. Technically, FKLI seems to well hold above 1000 psychology levels after been tested twice during the morning session. Based on the hourly price channel, we expect FKLI price would retrace lower in the coming trading session. Traders were advice to take profit on the existing long position provided resistance levels at 1035 and 1050 regions were not violated. Supports were seen at 1010 and 1000 regions. FCPO 3rd month July Futures contract plunge RM77 lower to close at RM2625 as compare to previous trading session with 15,238 lots traded in the market. Profit taking continues to take place as CPO price was not encourage by neither soybean oil and crude oil electronic trading nor overnight closing. 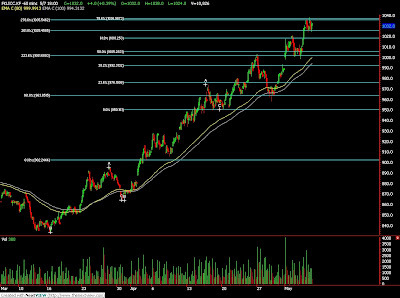 Technically, CPO price continue traded south after manage to rebound 50% Fibonacci figures at RM2724 regions. We expect CPO price would continue to trade south fiercely in the coming trading session provided resistance levels at RM2700 and RM2730 were not violated. Traders were advice to hold short position in the coming trading session while be extra cautious around support levels at RM2600 and RM2478 regions. FKLI April futures contract fall 6.5 point lower to close at 1006 as compare to previous trading session with total 8,454 lots traded in the market. FKLI was traded lower despite Dow Jones was closed firm for the past 2 trading session as most of the regional indices were traded lower during the trading session. Technically, FKLI seems manage encounter great selling pressure around resistance levels at 1025 and 1035 regions. We expect FKLI possible to test the resistance levels before starts to retrace after bull rally for almost 7 consecutive weeks. Traders were advice to liquidate long position while be prepare to hold short position if resistance levels were not penetrated. Support levels were seen at 1000 and 984 regions. FCPO 3rd month July Futures contract surge RM107 higher to close at RM2702 as compare to previous trading session with 19,894 lots traded in the market. Heavy profit taking activities come in place as CPO price fails to reach RM2800 psychology levels. 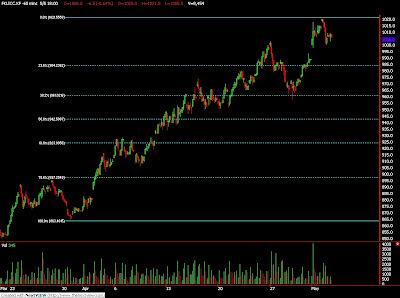 Technically, CPO price seems topped around 478.6% Fibonacci projection levels at RM2783 regions. We expect heavy profit taking activities would come in place after CPO price fails to breach 478.6% resistance levels at RM 2783 regions. Traders were advice to hold short position in the coming trading session as immediate support seen at RM 2581 and RM2450; 23.6% and 38.1% Fibonacci figure in order to cover the trading gap. Resistances were seen at RM2750 and RM2780 regions. FKLI April futures contract rose 18.5 point higher to close at 1012.5 as compare to previous trading session with total 11,081 lots traded in the market. FKLI was traded during the trading session as regional indices such as Singapore and Hang Seng Index surge up during trading session. Technically, FKLI seems met its projection figure at 250% Fibonacci figure at 1018.5 regions. 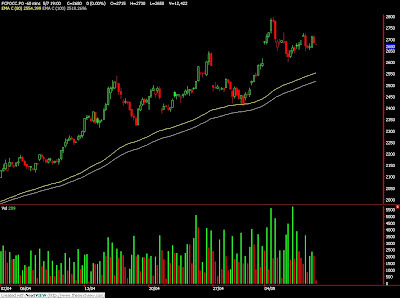 We expect FKLI would retrace in the coming trading session with immediate supports seen at 1000 and 981 regions. 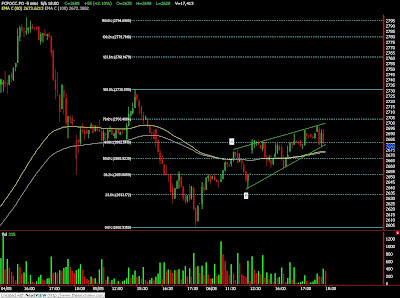 Traders were advice to hold short position in the coming trading session while be cautious around resistance levels at 1018.5 and 1025 regions.